FEEL BETTER. LOOK BETTER. BE BETTER. The 50Fit program is for people who’ve lost touch with their health. It’s for anyone ready to put more days in their life, and life in their days. Perform workouts which are quick and highly functional. Learn a simple yet effective framework for better eating. Practice ‘self-motivation’ for lasting and realistic results. The 12-week ‘Game-On’ workout phase with specific exercises to build muscle strength, heart & lung fitness and joint mobility. These 30-minute workouts are fast, efficient and need no or minimal equipment. A bonus 4-week introductory ‘Pre-Game’ workout phase designed to lay fitness foundation after a break from exercise. Re-ignite memory-lapsed muscles and get your heart and lungs pumping again. 12 x step-by-step instructional exercises videos demonstrating the ‘Game-on’ and ‘Pre-Game’ workouts plus a bonus warm-up routine video. 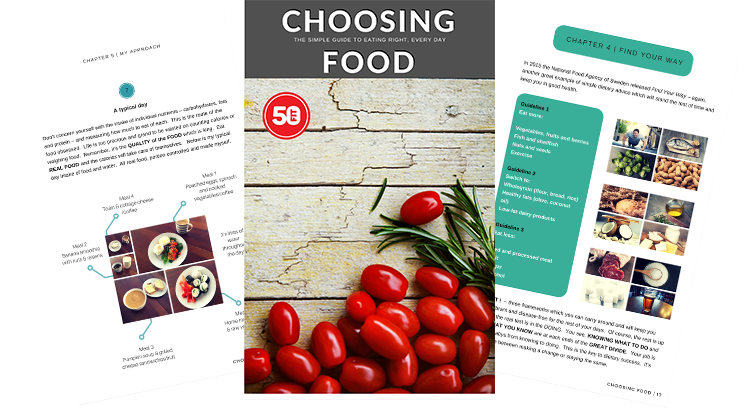 50Fit Nutrition Guidelines providing a solid framework for eating real food, everyday. 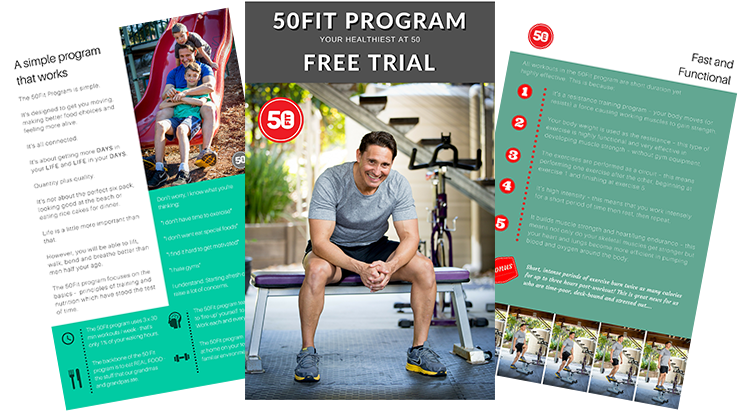 The comprehensive 50Fit Training Guide which explains each workout & everything you need to know about the 50Fit program. A day by day workout diary which maps each workout over 12 weeks of training plus movement modifications for each workout to accommodate your fitness ability. 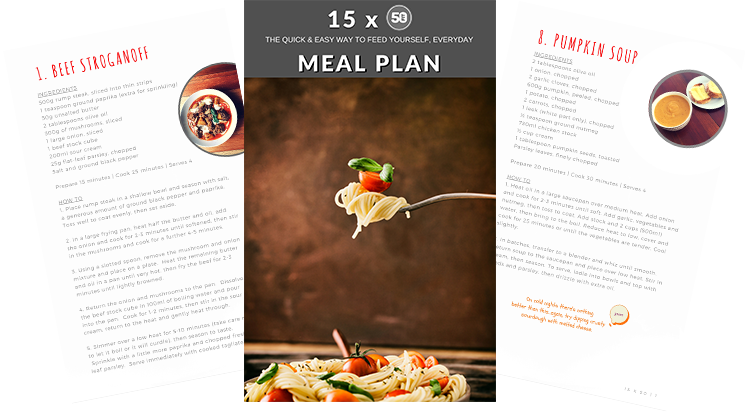 The simple yet effective ‘15 x 50 meal plan’ including all recipes to help you stick to the nutrition basics. 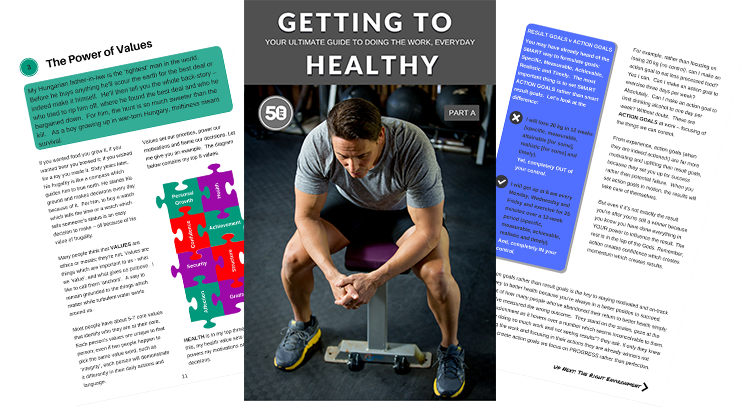 A bonus 60-page ‘Getting to Healthy’ eBook to assist you in building and maintaining your own motivation and positive mind-set. How to perform each workout. All your training questions answered. What workout to do and when. How to modify each workout for your fitness level. Each exercise easily referenced during your workout. How to find self motivation, everyday. How to 'win' at getting healthy. Nutritious recipes to keep your eating on-track. 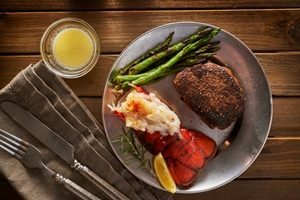 Simple and easy recipes to prepare. An effective framework for eating right, everyday. No counting calories, just real food. Many of us experience reduced quality of life due to the poor health choices we make – everyday. Overtime, these small yet incremental decisions can lead to chronic health issues. But with simple lifestyle changes – what we eat and how we move – health can be restored and indeed improved. The 50Fit Program helps you get ‘back in the game’ to avoid the effects of chronic disease as we age. As the ‘Provider’, it’s our duty to be fit and healthy for our family and friends. You aren’t much use to them on the side lines suffering ill-health through poor eating habits and nil exercise. The 50Fit program will build your health resilience to help bring your ‘A’ game every day for the people in your life who matter most. Turning 50 and beyond is a privilege denied to many experiencing poverty, disease or turmoil. For most of us, our lifestyle is grand in comparison – yet we choose to squander our health potential rather than rise to it. The 50Fit program will provide a ‘true north’ direction to build a stronger, healthier you – for the rest of your life. I know it’s important to exercise but I just don’t have time. That’s why each workout in the 50Fit program takes only 20-30 minutes to complete. Gone are the days of 1-hour gym workouts. Research has now proven that more is not always better when it comes to exercise. 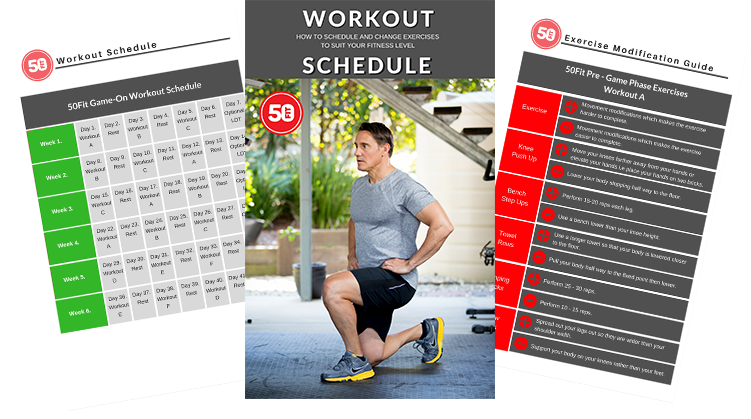 The design of the 50Fit workouts means that major muscles are worked intensely over a short period of time to develop strength and heart/lung fitness quickly and efficiently. To save further time, the 50Fit program calls for only 3 x days per week, so you can get on with doing other things in your life – family, kids, job. A commitment of 30 minutes, 3 x days per week represents only 1% of your waking hours – hardly an imposition! Won’t exercise make my joint pain worse. I know what you’re saying! I also suffer from the everyday, typical joint pain associated with living 50 years as well. Shoulder, elbow, back – you name it. While it’s not crippling nor life-restricting, I can still feel it. Surprisingly though, I find my ‘niggles’ get worse if I DON’T exercise, especially my shoulders. Joints need constant activity for mobility and for building strong tendons and supporting tissue. The saying ‘use it or lose it’ rings true when it comes to joint flexibility and movement. Also, in my experience, most injuries occur due to insufficient body warm-up prior to exercise. The 50Fit program addresses these issues in two ways. Firstly, the program uses body weight exercises which build muscle and joint flexibility. Done correctly, body weight exercises follow your body’s natural joint-movement paths. These exercises allow your body to move as it was designed to do – freely – without the restrictive ‘locked-in’ nature of gym machines. Machines can only be pushed/pulled in one way with no room for slight variations in body joint movement. Not the best result if you have joint pain. Secondly, I give you a thorough warm-up routine which will more than adequately prepare you for exercise, each and every time. It concentrates on joint flexibility and warming up the major muscles of the body so you can workout effectively and safety. It’s hard to find the motivation to exercise and eat well. Let’s face it we’re all human and most of us struggle to devote the time it takes to stay on track with our health. We start a program ‘full of beans’ only to find after a few weeks our interest and effort begin to wane. In my experience the main reason we begin a ‘health-kick’ and don’t follow-through is because we don’t anchor a big enough ‘why’ to our goals. In the 50Fit program I give you the framework to find your ‘why map’ – a process by which to develop the key drivers to motivate yourself. My ‘Getting to Healthy’ eBook is a collection of strategies and techniques to ensure your reasons to improve your health stay on true north. Sure we can gain inspiration from other fit and healthy people in magazines or on the internet, but learning how to ‘fire-up’ yourself is the secret to lasting motivation to keep you doing the work each and every day. I haven’t exercised in years so I won’t know how to do the exercises. I know that getting back into fitness can be a daunting process, especially when we are a little older. That’s why the 50Fit workouts come complete with step by step video instruction on how to properly execute each exercise. 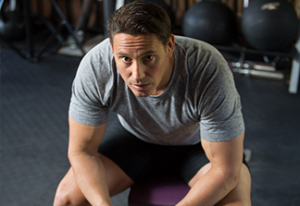 This instruction is backed by my physical education background and by utilizing these exercises in thousands of workouts in my 35 year of consistent exercise. Further, these exercises are tried and true and have stood the test of time. Done correctly, they work. Chances are you’ve grown up with them too. 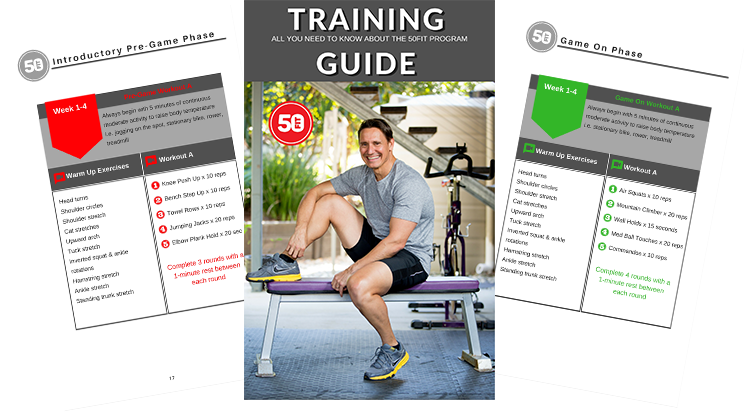 The program also includes a comprehensive training guide which explains the theory behind the 50Fit program and how to perform each workout. I’ve even included a workout diary so you can keep track of what workout to do on what days. Simple. I don’t want to be on a special diet. Neither do I! Getting healthy and eating well has got nothing to do with ‘special’ food this and ‘secret’ ingredient that. The backbone of 50Fit is to eat REAL FOOD – the stuff that our grand mum or dad ate before the popularity of our current high-calorie, low nutrient Western diet. I give you the guidelines to follow a ‘real food’ eating plan – foods made BY plants, not IN plants (you know, the big factory kinds!). The 50Fit program teaches you the ’15 x 50’ meal plan – a simple way to bring regular, nutrient rich meals into the home for the whole family. This eating plan won’t have you drinking shakes for lunch and dinner or preparing separate lettuce-leaves-for-a-week meals. The 50Fit program celebrates food as a sustainable, core element in keeping us healthy for the rest of our days. Why would I listen to you – what makes you any different from other fitness instructors. I’m different because I’m the same…the same as you. I’m middle-aged, have a family and go to work. I haven’t found the ‘secret’ formula for exercise other than toughing it out; I haven’t discovered the ‘breakthrough’ diet other than eating real food; and I don’t look to others for motivation, I only look within. But what I do know on my march to 50, is that things have changed. I am invincible or indeed immortal no longer. And while my health decline is inevitable – I have a choice. I can get on with living or I can get on with dying. I can invite disease into my life or I can delay it. I choose to do what I can to put more days in my life and life in my days. I choose to prevent the preventable. This means exercising and eating well most days and to be grateful for what I have, not for what I want. I want to show you how to prevent the preventable – to get you off the sideline and back in the game. To be you healthiest at 50. Oh and for the record I have a Bachelor’s degree in Physical Education from the Queensland University of Technology and a Master’s Degree in Sports Management from the Southern Cross University, NSW. I taught senior school physical education for 10 years but now teach corporate health and wellness. But I hate going to the gym. I get it, gyms can be intimidating places – especially with all those fit bodies and thumping music! It’s easy to think you’ve got to be at a certain ‘level’ of fitness before you can even show up to a gym, but not so. Gyms can be motivating places but for some they are about as comfortable as walking into the ladies underwear section of your department store, even with your wife!. That’s why I designed the 50Fit program to be done at home as well as the gym – whatever your preference. Of course with the 50Fit program you don’t have any expensive ongoing gym fees or locked-in contracts, not to mention saving on travel time. Exercising on your own terms in your familiar environment is always a better option, especially when you’re starting out on your fitness journey. The 50Fit program uses simple but effective body-weight exercises to achieve better results than complicated gym machines anyway. 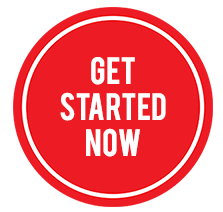 In case you need a ‘training partner’ my videos downloaded on your mobile device ensures you are only a swipe away from ‘me’ in your workout space. Easy. I don’t want to pay for the 50Fit program and realise it’s not for me. That’s why you can download the free trial without any commitment to purchase. If you realise the program is not for you, fine – you’ve lost nothing. If indeed you do decide that getting back to healthy is not only a priority but also within reach, you can go ahead and buy the full 12 – week program. At less than $10 a week it’s the cheapest gym membership you’ll ever own and all you’ll need to return to health, wellness and vitality. But most importantly you’ll be preventing disease and taking responsibility for your health to be the best dad you can be. But I don't like buying over the internet. Ordering online is very safe. We use only payment gateway providers who are industry leaders and who use the latest encryption technology to protect customer data. Your credit card details are never revealed to us or any other third party. Once payment is confirmed you’ll receive an email link to the 50Fit program to access all videos and digital content. All digital content is available in PDF download format for easy printing. Very occasionally the email is delayed (due to aggressive email filters) – but no more than 15 minutes. If this happens use the contact form to get in touch and we’ll resent the email. Links to the online videos and digital content are permanent so you can come back at anytime to re-watch or re-download.